In this post, we cover how to write and consume RESTful services asynchronously using this open source microservices platform. JAX-RS and MicroProfile REST Client make writing and consuming RESTful services both easy and powerful, especially when using their asynchronous capabilities. In this post, we’ll look at how to use asynchronous JAX-RS resource methods on the server-side. There are limited use cases in which async is suitable on the server, so we’ll try to cover those cases where it is most useful. Async on the client can be very beneficial. We’ll cover the advantages, and we’ll also go over the different ways of implementing an asynchronous client including the JAX-RS 2.0 async APIs, the JAX-RS 2.1 reactive APIs, and the MicroProfile Rest Client 1.1 type-safe, async APIs. The application makes RESTful calls to an airline service, hotel service, and car rental service in order to make reservations and determine the total cost of the trip. So what does this actually do? First, notice that there is a fixed thread pool, limited to 10 threads (this is for simplicity — a better practice would be to make the thread pool size configurable with MicroProfile Config so that you could change this setting without recompiling). We might choose to limit the size of the thread pool to prevent overloading the back-end resource, a database in this case. Next, notice that the getReservation resource method doesn’t actually return anything. Instead, it creates a new Reservation in a Runnable (via lambda) that makes a database call and then returns the reservation to the client through the AsyncResponse object. This means that the thread invoking the getReservation method can return immediately to handle new requests. The client won’t see a response, however, until the call to the Reservation has been constructed and passed to the resume method, which might take a little while depending on how long the database request might take (DBHelper…). This example is essentially throttling access to the database. Let’s suppose that the database is running slowly for some reason. If we implement this method synchronously, we might run into a situation where the database starts rejecting work, leading to exceptions thrown back to the client. By implementing this asynchronously, we limit the connections to 10; additional requests would be queued until they could eventually be executed by the executor service. This is ideal so long as the database can eventually catch up with the work. In practice, it is my opinion that there are relatively few use cases where asynchronous methods on the server are more effective than their synchronous counterparts. Throttling access to another resource (as above) is one use case. Others might include where the thread factory has created threads optimized for the response (i.e. they already contain data on a ThreadLocal). Perhaps there is a performance benefit on some application servers; Open Liberty uses a well-tuned, global thread pool, there aren’t a lot of performance benefits to using async methods on the server. This slightly more complex example uses an InvocationCallback which will be notified when the async response has completed (either through the completed method if the response is successful, or the failed method if not). We tell the client to invoke the services asynchronously by invoking the async() method on the Invocation.Builder object that is returned from the request()method. That returns an instance of AsyncInvoker. From there, we use an instance of the callback to asynchronously invoke three different services. We’ll only end up waiting for as long as the longest of those three services. Very efficient! In a failure case, we log the exception and then propagate it back to the client. Also, we are caching and re-using the WebTarget for each remote service. This avoids a lot of object creation in the JAX-RS implementation code, improving overall performance. This works well, but JAX-RS 2.1 gives us another option: a reactive client API. JAX-RS 2.1 adds support for reactive APIs. Out of the box, JAX-RS 2.1 supports a CompletionStage return type. This allows users to string together a chain of stages that can be completed asynchronously. JAX-RS 2.1 also allows users to extend the reactive capabilities of the client by using other reactive providers such as RxJava, Guava, etc. For simplicity and brevity, we will only cover the CompletionStageapproach here. My colleague, John Koehler is writing a blog post that will provide more information on reactive extensions. Stay tuned! Similar to the async() method in JAX-RS 2.0 (which is still available in 2.1), we get an instance of a CompletionStageRxInvoker by using the rx() method on the Invocation.Builder. The CompletionStageRxInvoker has methods similar to the AsyncInvoker, but returns CompletionStage rather than Future. Also note that these methods do not take an InvocationCallback either. Functionally, the JAX-RS 2.1 reactive client example here is not much different from the JAX-RS 2.0 async client, but I think the reactive example is cleaner and easier to understand. And less code to maintain is also nice! 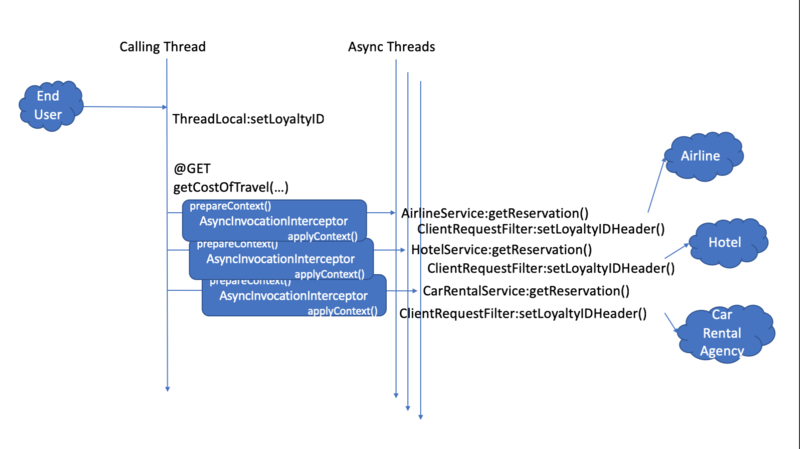 MicroProfile REST Client takes a different approach to accessing remote RESTful services — a more type-safe approach where an interface, annotated similar to a JAX-RS resource, represents a remote service. Invoking methods on the client interface would be similar to invoking methods on a service hosted locally — with clever usage of providers like ResponseExceptionMapper, ParamConverterProvider, MessageBodyReader, MessageBodyWriter, etc. — which allows us to design a service interface that indeed acts like it is local. In order for a REST Client method to be executed asynchronously, it must return a CompletionStage. Note that in MP REST Client 1.2, it is also possible to use MP Fault Tolerance’s @Asynchronous annotation. This functionality is outside the scope of this post, but the gist is that if your interface method returns a Future, then the MP Fault Tolerance implementation will invoke the method on a separate thread, immediately returning a Future. You can find more information about the Fault Tolerance APIs at the project site. This is even cleaner than the JAX-RS 2.1 reactive client API! The MP REST Client approach also solves a problem of what to do with ThreadLocal objects that might be required for providers on the outbound request. Let’s say that we have a ThreadLocal object in our application that determines whether a given customer is a preferred loyalty club member. If so, we might add a ClientRequestFilter that would create a custom HTTP header to indicate that to the remote airline, hotel, or car rental service — something like Loyalty-ID: 1234 that might be used by the remote service to upgrade the reservation. 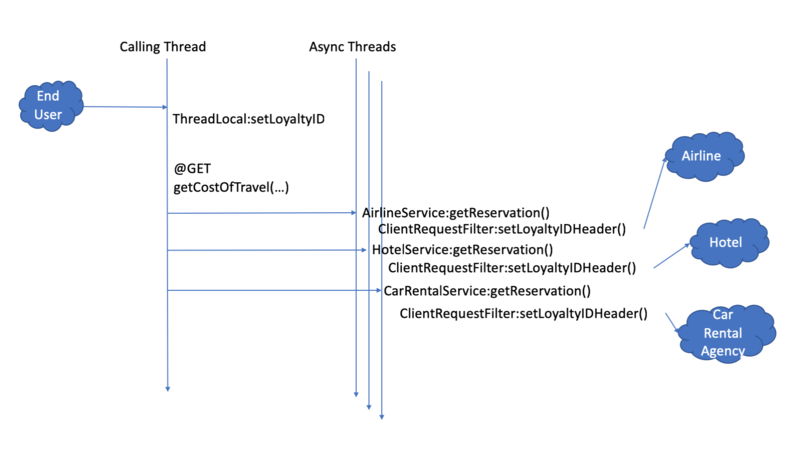 The problem is that if the ClientRequestFilter checks the ThreadLocal object for the loyalty ID number on the asynchronous thread, it won’t be there — it was associated with the calling thread, not the async thread. This picture might help clarify the problem. Notice that the Loyalty ID is set on the calling thread, but that ID isn’t propagated to the async threads that are making the requests to the remote services. That’s where the AsyncInvocationInterceptor comes into play. This is a provider type introduced in MP REST Client 1.1 that allows users to propagate ThreadLocal objects — or really anything that is associated with the calling thread. This interface contains two methods (a third method is added in MP REST Client 1.2 for removing contexts): prepareContext() and applyContext(). The former is invoked on the calling thread prior to "swapping" threads. The latter is invoked on the async thread. With MP REST Client we can get our loyalty discount and save about $200! It’s getting easier to do things asynchronously with REST and Java. JAX-RS and MicroProfile give you some powerful tools in this space. Hopefully, now you are more prepared to write and consume RESTful services asynchronously. Published at DZone with permission of Andy McCright , DZone MVB. See the original article here.